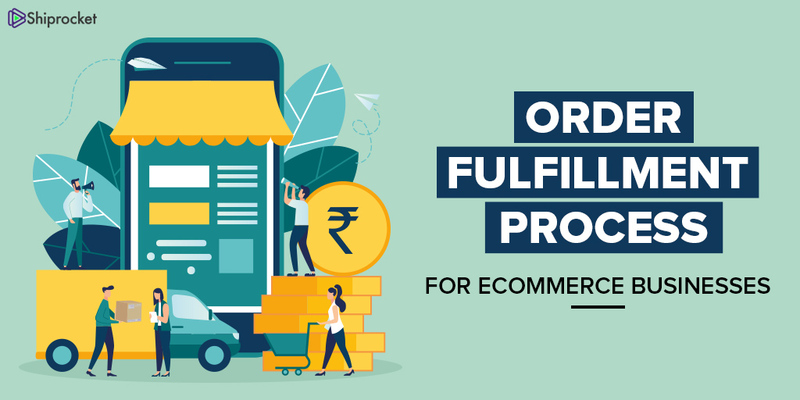 eCommerce in India has evolved tremendously over the past few years. From selling to a small group of people actively using the internet, eCommerce has reached to a vast consumer pool across the country. With the government taking initiatives to help online sellers, many are even beginning to sell their products abroad. People’s expectations from eCommerce businesses have also increased. What seemed like an option to go for when you couldn’t find something in the store, has now become a preference for many. So much so, that about 38% of sellers now say that they will abandon their cart if they do not receive their order within a week. But when we get to the bottom of it, what drives eCommerce? It is not just a single process; it’s a combination of different procedures and units that work in synchronization to deliver to you your desired product. Let’s find out what these procedures are and how they function. Order fulfillment refers to the entire process starting from the sale, up until the post-delivery experience of the customer. It covers all the essential aspects such as receiving, processing, and delivering orders. Most eCommerce sellers carry out order fulfillment themselves or outsource some of the operations. A great example of order fulfillment is Amazon’s FBA plan wherein they cover all the processes that are involved after you sell a product. Let’s take a closer look at these steps to learn more about how eCommerce fulfillment functions. It is an ongoing process, and you can place it on the first or second position. For us, inventory management comes first because you need to have a good idea of your stock before you can begin processing any order. An updated inventory with SKUs marked for each product is non-negotiable. Regular audits should be carried out to ensure its correct implementation. Deploy warehouse management software for better management of your products. Add SKUs and tally them with your products to avoid any confusion. Also, check if the items are in shape, if found defective, discard them and make arrangements to purchase new ones. Inventory management also includes storing inventory. 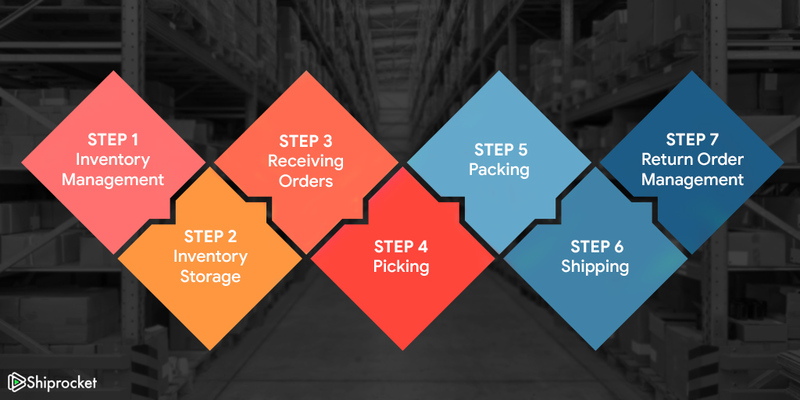 This step is one of the most crucial as it determines the speed of your fulfillment operations. If not done appropriately, you can spend time finding products which can lead to a delay in processing. Furthermore, you can also lose out on the stock if you don’t store it correctly. Therefore, arrange your inventory in proper shelves and bins along with the correct labels to avoid any hassles during picking. Optimize your warehouse space to accommodate all items. This step runs parallel to inventory management. You can accept orders manually or integrate your cart or marketplace with software to directly fetch orders from your store. Once you have set your preferences for receiving requests, begin by sorting them by delivery dates. For example, if a person has chosen one-day delivery, keep those orders on top priority. Send your customer an email confirming that you have received the order and an estimated delivery date, if applicable. If you cannot provide a fixed delivery date, give a time frame as to when they can expect the delivery of their order. Picking constitutes scanning through your warehouse and finding the product required by the customer. This order can include one product from one location or two products from two corners of your warehouse. Again, an uncomplicated picking is only possible with a sorted warehouse. If your business receives many orders, hire a dedicated staff for warehouse logistics. This measure will help you accelerate your fulfillment process and also save costs by streamlining the procedure. Invest in automation and technology to speed up the picking process. Packaging forms an essential part of the chain as it is a tangible representation of your brand. Therefore, you need to focus on different types of packaging and what works best for your business. You can invest in sturdy but straightforward packaging if you feel the packaging is not your primary focus or you can go for a customized packaging if you can afford it. In whichever case, make sure your package is adequately packed, labeled, and matches the standards set by courier companies. The packing should be able to bear the friction caused due to transportation. Without shipping, your customer cannot transform into a buyer. Therefore, it is the most vital component of your order fulfillment process. Make sure you carry out a thorough check before signing up with any courier company or aggregator. As shipping determines the final impression of your brand in your customers’ mind, try to provide them with a seamless experience. Give them varied options for payment such as cash on delivery and prepaid fees. This step ensures they have variety and you do not restrict them to just one mode. Also, make sure you partner with a courier that provides you a broad reach across India and the world. Mostly, the order fulfillment chain ends at the delivery of the product. But with changing times, return orders are something added to your process. With increasing competition, return orders are unavoidable. Thus, handling them effectively is what counts. Therefore, opt for a method that can help you automate your NDR and further process return orders easily. This way, you can also reduce your returns and save on return orders by a large margin. 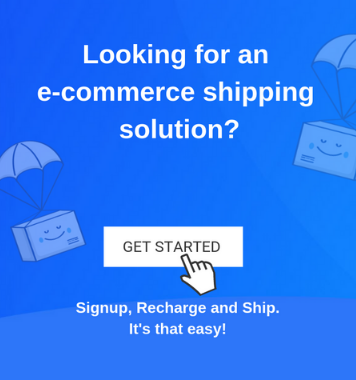 Courier aggregators like Shiprocket are known for providing more than just hassle-free shipping with features such as inventory management, automated return order processing, and the cheapest shipping rates where your order fulfillment can be carried out at one place.